"We are never more truly and profoundly human than when we dance." ​MODERN DANCE CLASSES explore the intricacies of dance movement based on the principles of the Limón Technique. Focusing on coordination of breath and weight in terms of falling, rebounding, and suspending, we will explore different uses of space, time, and energy. Each class will layer various dynamic ranges to enrich our most honest human expression with clear intention and musicality. REPERTORY CLASSES immerse dancers in Limón’s rich choreographic works and will have the chance to experience his vision from within. Dancers will gain a deeper understanding of Limón’s artistry and choreographic genius through investigation of his themes, motivations and intentions. As the dancers apply their artistry as vehicle for his vision, the works themselves will also become a vehicle for the dancers to get to know themselves and expand their artistic color palette. ​BALLET CLASSES with Ryoko can be geared towards dancers fairly new to ballet and/or those looking to deepen their training at a basic level. Class will start with a gentle warm up, barre work, center, and phrases across the floor while focusing on proper alignment, flexibility, coordination and musicality. Feel free to work at your own pace, ask questions, and most importantly, enjoy the process of fine tuning your body and mind for a graceful and fun dance experience. ​Ryoko's Dance Classes are offered at Berkshire Pulse. ​Ryoko Kudo toured with the Limón Dance Company for over ten years and has had the privilege to dance works by world-renowned choreographers such as Lubovich, Kylian, Linke, Koner, McKayle, multiple works by Limón and Humphrey. She has taught and re-staged Limón works at the Canadian Children’s Dance Theater (Canada), Arte Centro (Guatemala), Bratislava Academy of Dance (Slovakia), ArtEz (Holland), and Casa de la Cultura (Mexico). In the U.S. she has taught at Marymount Manhattan College, SUNY Purchase, Point Park College, Bryn Mawr, Mont Clair, University of the Arts, Drexel University, Limón Institute, Peridance. ​She is currently an adjunct faculty at Simon's Rock (MA), Williams College (MA), and Berkshire Pulse (MA) and guests yearly at Congresso Brasileiro de Dance Moderna (Brazil), Tecniche di Danza Moderna (Italy), Jacob's Pillow (MA). 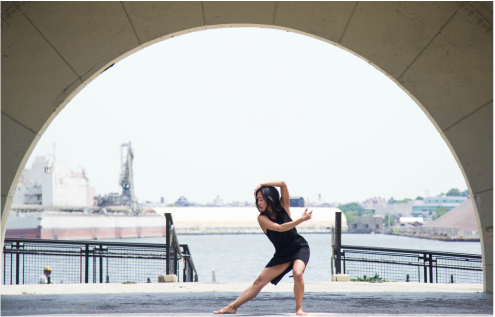 Ryoko received her training from Emerson College, The Boston Conservatory, Ailey School, Graham School, and Limón Institute. Ryoko is deeply grateful for her teachers and mentors for their gifts of passionate teaching, guidance and for planting many seeds to grow: Jennifer Scanlon, Carla Maxwell, Sarah Stackhouse, Risa Steinberg, Jim May, Clay Taliaferro, Yasi Tokunaga, Yuriko, Ken Topping, Jaclynn Villamil, Janet Panetta, Ernesta and Andra Corvino. "Ryoko Kudo sparkled in a solo of playful sideways dips and turns, her feet flicking like insect wings."